Beautifull lithophyte, indigenous to limestone canyon walls in Chiapas. It's scurfy, leathery, pink leaves are covered with dense trichomes. The pink inflated and rarely branched inflorescence prouces dark violet flowers. The colorful spike can last up to one year. Easy to grow mounted on wood or cork. Makes several offsets. Prefers bright light and plenty of air movement. TILLI-CARDS are a reference guide for growing Tillandsia Air Plants. Whether you are new to growing Tillandsia Air Plants or an experienced collector you will find the TILLI-CARDS app to be great resource. The commonly named “Air Plants” are actually Tillandsias. Tillandsias are a Genus in the Bromeliad Family, the same family as the pineapple. Many of these air plants grow epiphytically - on braches of trees. 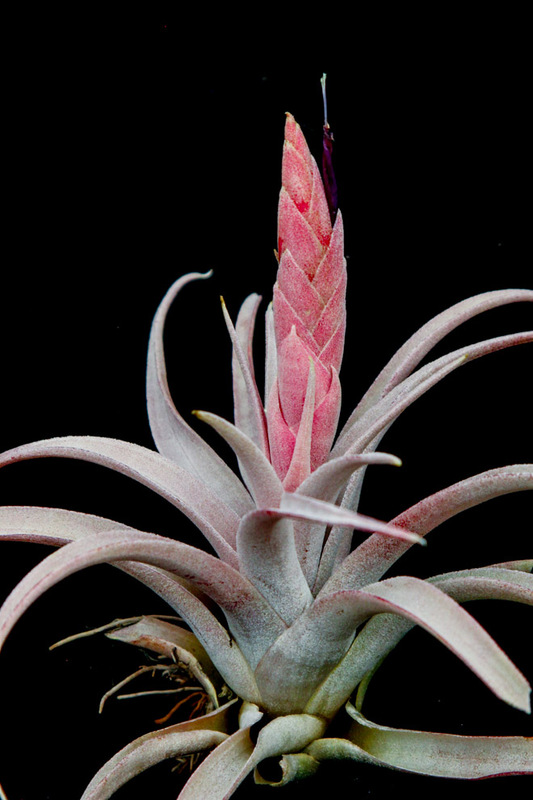 They are growing in popularity and this new TILLI-CARDS app will guide you to care for your air plant.